Many parents today despair about the mindless quality of many children’s toys and games these days. These toys and video games all seem like they’re contributing to dumbing down the next generation. That’s why some parents are fighting back by giving their children the best science toys they can get. As toys, they are fun and therefore kids can associate science with excitement and fun. These toys can also help illustrate scientific facts and principles in a way that children can comprehend. Of course, it helps if you get the proper science toys for your children. Fortunately you have a wealth of choices to pick from. Here are 14 options you may want to consider. This toy was the winner of the Best Robot Award in 2015, and it operates like a tiny programmable robot vacuum cleaner. This robot is really small at just an inch across so you can take it with you wherever you go, and it’s rechargeable too. Very young kids can start with color coding, by drawing colored lines on paper and on the kids’ tablets, and the Ozobot can read those lines. Those colored lines control the speed and direction of the robot, as well as the special moves. After a while, your child can use the app to learn the block-based programming language. It’s like programming, except that your child doesn’t see the results of their code on screen. Instead, their code tells the robot what to do. The robot toy can navigate racetracks, mazes, and cityscapes that your child creates. What's Great About It: With the app and the website, the Ozobot is a great way for kids to learn the basic principles of programming. Coding doesn’t have to be a complicated process, and your kids can learn that the process and results can be fun. There’s no doubt that the periodic table is one of the most informative tools in chemistry, except that, for many kids, the subject matter is just too tedious and complicated. This poster introduces the periodic table to younger children, and it helps older kids to understand how to use it. 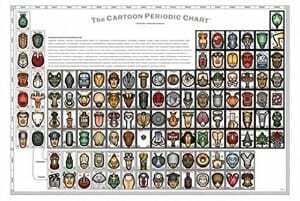 Basically, it’s a cartoon version of the periodic table. It’s a nice size that allows each image to be clear and easy to understand, and it can really help kids remember the periodic table. It’s humorous and makes the periodic table exciting to learn. The words used are easy to read, and the pictures match the elements perfectly. What's Great About It: Lots of parents wish that they had this sort of periodic table when they were in school, so being able to introduce their children to this difficult part of science in such a fun and exciting way is a treat. As your children grow older, the risk of them swallowing coins decreases. They become fascinated with how coins can spin rather than how they taste. You can take this fascinating display to the next level with Euler’s Disk, which is a truly mesmerizing demonstration of disk, or coin, spinning. 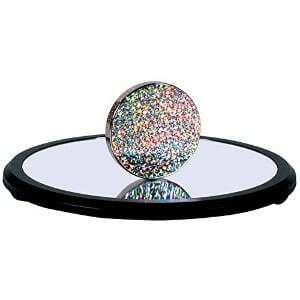 This toy has a 3-inch disk, along with a 9-inch mirror for its spinning surface. As you spin the disk, it turns while showing a rather captivating light display. The disk spins for a long time, giving your child a truly captivating experience, rather than it falling to its side every few seconds. It also makes a sound as it spins. As it gets lower and lower to the ground, the sound becomes faster and faster. Naturally, your children will wonder why, and their curiosity will be piqued to try find out how it works. Many adults put this toy on their coffee tables because it is much more engrossing than magazines or coffee table books, and is a great conversation starter. This set comes with 9 pieces of magnetized holographic foil, which creates the special effects. What's Great About It: If you’re a parent and your kids ask you how it works, don’t worry about having to do online research. The instructions also include the scientific answers to children’s FAQs. This set even made an appearance on the TV show "The Big Bang Theory" as it was so popular. This is a multi-award winning toy that’s geared towards fascinating children with its lights and music. That’s especially true if the lights seem to be dancing with the music. With this toy, your children don’t just see the light and music interact—they build the system to make the light and music go together. It’s the kids’ version of electrical circuits. Here you have more than 30 available parts which your kids can put together like a Lego set. The connections are secure and easy to use, and your children don’t need tools to put them all together. The instructions include numerous different projects that your children can build. 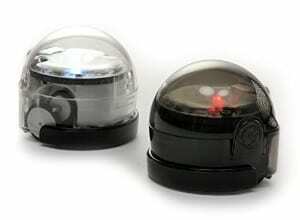 These include a siren with an adjustable volume, a flashing light, and a photo sensor. What's Great About It: The instructions are illustrated, so kids can easily understand them. Your children can work on more than 100 different projects, so there’s a lot of variety to keep them busy for hours of exciting science play. Equating science with magic can really pique a child’s curiosity, since so many kids are familiar with and love the Harry Potter series. This is the kit that your kids will want before they get their letter to Hogwarts. It’s even complete with 2 wizard hats and a wand. You can equate this science kit with the Potions class at Hogwarts, which we, as Muggles, know better as chemistry. 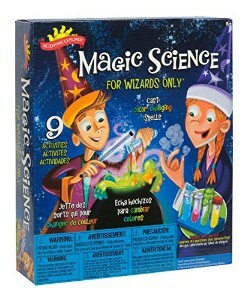 With this kit, you child will have powders and potions that can change colors and the potions can even glow in the dark. All the necessary potion ingredients are included in the kit, as well as all of the test tubes and scoops that your little science wizard will need. There are also colorful study and activity guides that will help your kid's associate chemistry with fun. What's Great About It: The wand is really cool for your kids to play with. It may be a small thing, but anything that helps young kids regard chemistry as a fun magical process is always going to be cool and exciting. 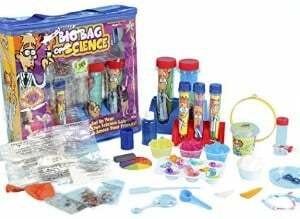 This is another science lab set, and it’s for kids who have seen lots of movies with science labs and scientists doing cool stuff on the screen. The various components have been sized for little hands, and they’re all colorful to appeal to your child. Within this kit, you have all the paraphernalia that you need so that you can mix lots of potions together. These include test tubes and stands as well as funnels, beakers, an eyedropper, tweezers, goggles, and a magnifying glass. All of the included parts are made from durable plastic. You also get an activity guide which will show your child how to mix ingredients together to make whichever potion they would like. 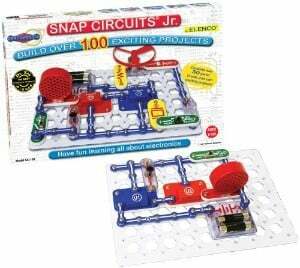 What's Great About It: The best thing about this kit is that it’s easy to use, and your kids can create lots of experiments to perform that can capture their attention for hours. It helps that it seems like an “official” lab set or a potions kit. The goggles also help sell the entire kit as legitimate for your child. There’s been some discussion as to whether the various science lab ingredients included in lab kits are really safe, but with this kit you can get the supplies your kids need for the experiments from your own kitchen. 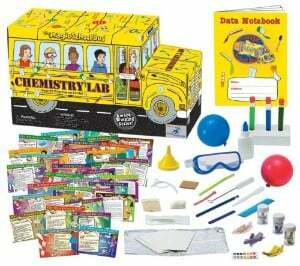 With this kit, you have all of the lab components that your kids will need to do the experiments, including the mandatory goggles and funnels for the test tubes. The concept of acids and bases are explored with this set, and for that you also have pH paper. You can also teach your little scientists about the concept safety, especially when you mix ingredients together. The goggles help emphasize this point. What's Great About It: You get 50 activity cards that explain the various lab kit components and the experiments that your kid can do. These cards are easy to understand. They even emphasize the importance of preparation as the experiments are useful when you have your materials and supplies all ready to be used. Which part of science does your child want to focus on? Their interest in science may be like their interest in video games—they like different types. If that’s the case with your kids, then this big bag of science toys is ideal. It covers a variety of science topics, including magnets, geology, biology, chemistry, and physics. The experiment book is very helpful, since the experiments can help answer questions that most kids, and many adults, have wondered about, including how a compass uses a magnet, what causes burping, and why baby diapers are absorbent. Your child will be able to see how a sunscreen really works and discover what makes up water. The lab kit includes lots of equipment pieces that you don’t always find in other lab kits, such as beads, a plastic ring and hex nut, iron filling and a magnet, and a color wheel. What's Great About It: Some of the experiments are meant to be done outdoors. They can get messy, but that’s a good thing for learning. 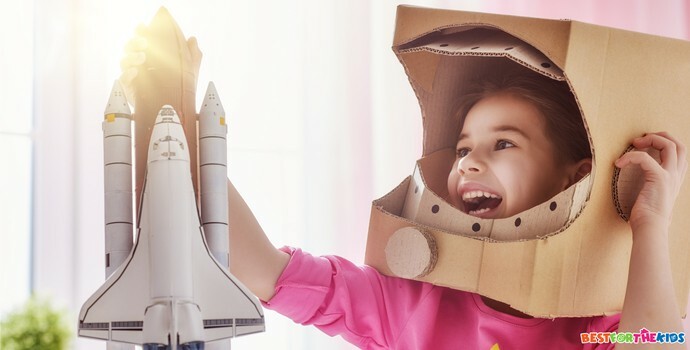 Your kids will realize that science learning isn’t always done indoors, and it’s not always neat and tidy - perfect for exciting experimenting and learning. Some lab kits can be replicated by using various household items, but that’s not the case here. This physics workshop includes more than 300 individual pieces, and that’s not a collection you can easily gather with makeshift substitutes. This kit is quite unique, since it revolves around physics instead of chemistry. 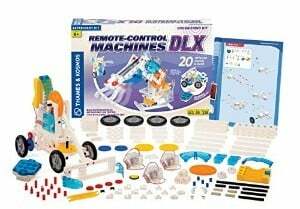 With this kit, your child can build up to 36 models, and with the various experiments that are included, they can begin to understand the basic concepts of mechanical physics. It starts with pulleys and levers and then continues on with pendulum clocks and centripetal force. Other concepts include equilibrium and how sail cars can be stable, so there is plenty for your little experimenter to try out. What's Great About It: With the manual, kids are able to build models and conduct experiments using the models in motion. This kit is like a Lego set, except that your kids build stuff that they can use for more experiments. A single model with the experiments can engross your kids for hours. Some parents would like their kids to understand the concept of nature and the environment. However, some children, especially boys, aren’t exactly thrilled by doing anything that resembles gardening. 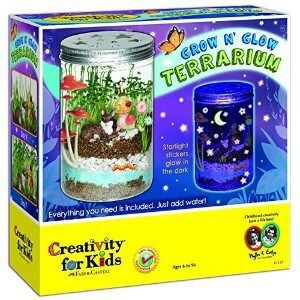 This kit should help entice them, since it’s a garden in a jar and they can use it as a decoration for their room. With this kit, your kids will the plant seeds, and they can see for themselves how these seeds turn into growing plants. It also teaches responsibility, since they have to remember that they need to water the plants, which you can cite when you remind them to drink enough water each day. This kit includes the Mason jar and everything you need to put in it, including the soil, sand, small pebbles, small animal figures and garden image stickers. What's Great About It: What kids will find really cool about this kit is that it has 45 stickers that glow in the dark. Also, plenty of video games involve building worlds and gardens, so now your kids will have a real world example. At some point in their young lives, children will wonder about the many different types of stones they see around. They’ll also admire gemstones and be curious about why they are so precious and expensive. The ROCK ON! 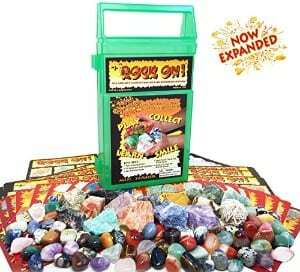 kit includes 15 top quality stones that are shiny, large, and really cool-looking. There’s a picture guide that tells your child about other types of rocks, and they can be encouraged to collect different rocks as well. There’s also a game board with playing cards to add to the fun. What's Great About It: The urge to collect things can be pretty powerful in certain people, and for many it can start at a young age. This urge can help your little ones learn about rocks and geology, and they can end up with a valuable collection that they will treasure even when they’re older. 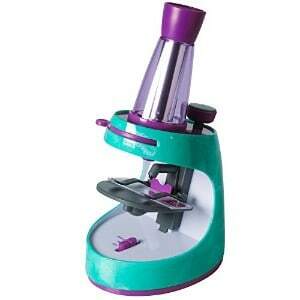 Microscopes are arguably one of the most fascinating scientific tools for children. But aren’t these instruments just for “real” adult scientists because they’re very pricey and easy to break? That’s not true at all, as you can see with this awesome kids' microscope. This isn’t just some hyped-up magnifying glass either. It’s a microscope that can show tiny objects 30 times to 400 times larger. All of the accessories are also included, from petri dishes, tweezers, and a small and safe scalpel. It’s made of plastic, and that actually makes it more durable. It’ll still work even if your kid bumps or drops it. All in all, it’s not surprising that when this first came out in 2013 it won various “Best Toys” awards, so this is one set your child is guaranteed to love. What's Great About It: Kids, and adults, can be easily fascinated by just how different tiny objects are when they’re magnified. This is especially true for very small animals, feathers and human skin cells, which all look very different from what you imagined. You can also take a photo through the eyepiece and share it with your friends. This isn’t just a balloon. 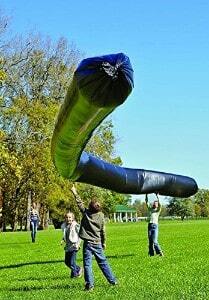 It’s a 50 foot balloon that is solar-powered too. This large balloon toy will fascinate and thrill your children, and it comes with a 400 foot long string and a user's guide. This balloon is simple enough to use too. Remember how ordinary balloons rise in the air, but as time goes by the balloons shrink and droop? With this balloon, you can inflate it with any gas you want, and after a while in the sunlight it will start to rise in the air and you can "fly" it like a kite. What's Great About It: While it’s a toy, this balloon also works well for classroom experiments and science projects. With this kit, a student can experience solar power, thermodynamics, convection, buoyancy, as well as Pascal’s and Bernoulli’s principles. Kids can have a rather warped sense of "grossness", and that’s especially true for boys. To keep your gross-loving boys (and girls) entertained, you have a science kit that helps them explore all the yucky body parts and byproducts. With this kit, your children can finally discover the truth for themselves regarding their disgusting questions about farts, stinky feet, and various micro-organisms in the human body. What's Great About It: Kids can also grow their own mold and bacteria, but you don’t need to be alarmed, as these are the friendly variety and are completely safe for your children to interact with. “Science” is a rather broad topic. It’s like sports—your kid may have a particular preference for a specific sport like basketball or football. It’s the same in science, as your child may have an interest in chemistry or astronomy, but not biology. Of course, you should also make sure that the toy is actually grounded in real scientific principles. You don’t really want a toy that says that the earth is flat or that the world is only a few thousand years old when science has proved otherwise. Most toys have a recommended age range, and with science kits, you absolutely want to adhere to these suggestions. Toys for older kids may be too complicated for toddlers, while teens may be bored with the toys geared towards preschool tots. You may also want to consider gender suitability. Most toys are designed to be used by both girls and boys, but sometimes there are science kits that are only for boys, or vice versa. These kits will be based on specific interests of each gender. 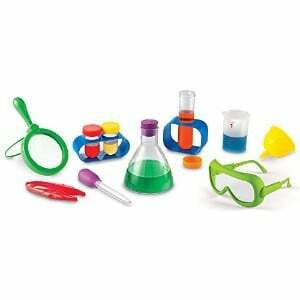 These toys are supposed to make science more understandable and fun, so the toy should be easy for your child to use. You may want to read customer reviews to see if kids are able to play with a toy easily. If they can't, they will lose interest. Science toys are also supposed to make science more enjoyable and interesting instead of dry and boring. Again, you may want to read parents’ reviews regarding how long a game has held the interest of their children. Children have been known to get over excited and be a bit rough or clumsy with their toys. Naturally, you don't want to buy a science kit that your little one will break within a few minutes. Consider the materials that have been used in the production of the parts to find something that can withstand a few knocks and drops. The good thing about science is that, unlike art, it deals with cold hard facts. The tricky thing about science is that its cold hard facts can be boring for children to learn, and can be quite complicated as well. These are the difficulties that the best science toys are designed to overcome. 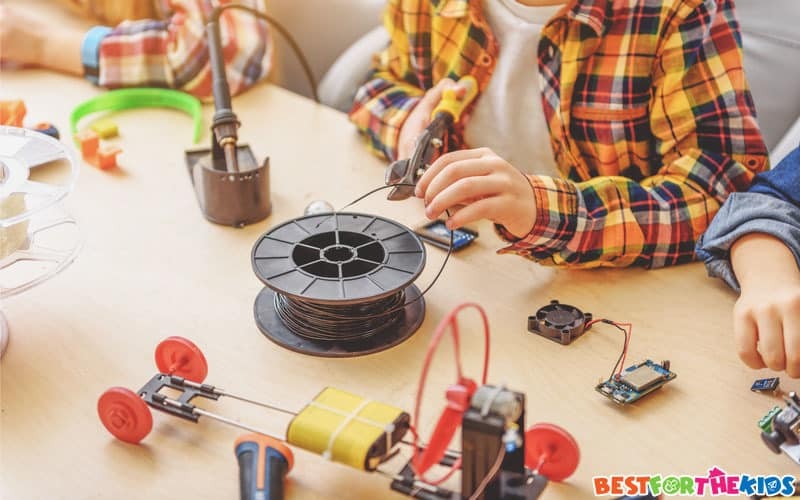 Ask many scientists and workers in engineering and technology today, and many of them will admit to playing with these types of toys early in their childhood. The same thing can happen for your kids. Even if they do get a career outside of the science field when they are older, an interest in science is a great thing. 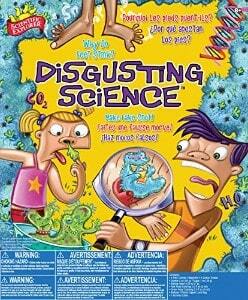 It makes children curious, teaches them scientific principles, and helps them think logically. All of these traits make the world a better place. So try to include a science toy for your kids during birthdays and holiday seasons. They’re not all that expensive, unlike real scientific tools such as telescopes and microscopes. Your kids can have fun and learn at the same time, and as a parent, you can always take pride that your little one is a science genius.